Julian Chex Chirix was born in Comalapa, Guatemala. 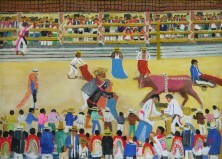 The village of Comolapa is well-known for its artists who paint in a primitive or naïve style. These indigenous painters depict the customs, traditions, and everyday activities, especially religious ceremonies and rituals, of their native people. The driving force behind these artistic creations is a strong need to demonstrate the feeling of belonging to a culture and its traditions and history.